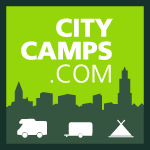 Also bigger groups can stay at one of the Citycamps. You can rent nice group accommodations for a maximum of 52 people with 8 bedrooms and 2 large bathrooms. Or a group accommodation with 2 large bedrooms for 12 people. The rooms have bunk beds and a bathroom.